Join us in the land of Saints and Martyrs! This country is a big surprise to everyone. Staunchly Catholic, intriguing history, friendly people, safe and secure, excellent hotels and delicious food. Plus, gorgeous churches, special Masses and following some of our most incredible saints. Contact Miranda at footprintsofgod.com/ctscentral.net or at 866-468-1420. To see daily videos and pictures from our 2016 Poland pilgrimage, click here. Listen to Al Kresta and Steve Ray discuss their upcoming pilgrimage to Poland. “I cannot wait for this Poland trip this August! Poland has been on my bucket list for years and I cannot think of a better way of satisfying that list item than a pilgrimage with Steve and Janet Ray. Not only is Poland rich in spiritual and secular history but it was pivotal in the fall of Communism. We have truly loved each of our Pilgrimages with you and I would be hard-pressed to chose my favorite (Footsteps of St Paul, the Holy Land, and Lourdes /Fatima). I have to say that I’m especially excited about this one because we’ll be visiting so many places that impacted the world and the Church. It will be like a tour of the 20th century through a Catholic spiritual lens. God bless you as well. See you soon in Poland. It was one thing to go to Poland to follow the footprints of Pope John Paul II, it is quite another now that he is SAINT John Paul II. 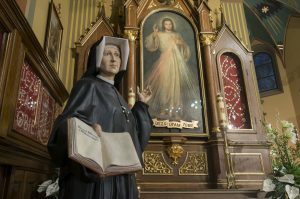 It was here that the Divine Mercy Devotion originated and it was Pope John Paul II and St. Maria Faustina who brought this great gift to the world. We will follow them both and pray the Divine Mercy in the Basilica of the Divine Mercy with the Sisters of Our Lady of Mercy. One of them will give us a talk and welcome us to the convent. We will spend time praying and meditating in the basilica in front of the relics of St. Faustina. The hometown of St. John Paul II has turned his childhood home into a museum. We will follow him throughout his life, even to the mountains of Zakapone where he went to relax, hike and ski. We will spend time at the spectacular new John Paul II Center in Krakow. Poland has been richly blessed with saints and spiritual riches. We will visit Auschwitz Concentration Camp where many Catholics died as martyrs. We will venerate St. Maximilian Kolbe and pray at the cell where he was starved to death, giving his life as a substitute for another man. Poland is rich with culture, great local cuisines, majestic churches and a proud people with a thousand years of Catholic heritage. We will delve into it all with the best English speaking and Catholic guides the country can offer. Excellent hotels, services, buses await us with an itinerary that covers it all. Depart USA on overnight flights for Warsaw, Poland. Upon arrival in Warsaw, meet our Catholic Polish tour manager and transfer to the center of Warsaw. This afternoon, celebrate Mass at the Church of St. Stanislaw Kostka, outside of which is the tomb of Fr. Jerzy Popieluszko, chaplain and martyr of the Solidarity Movement. After Mass, explore the museum of Fr. Popieluszko. Next, enjoy a Welcome Dinner hosted by Steve and Janet Ray in the reconstructed Warsaw Old Town featuring colorful houses, art galleries, and quaint restaurants. Overnight in Warsaw (Note: activities today depend on the actual flight arrival time). Depart to Niepokolanow – the Immaculata city, built by Fr. Maximilian Kolbe. Celebrate Mass at the Shrine of Fr. Maximilian Kolbe. Return to Warsaw for a city sightseeing tour that introduces us to the most important sights of the capital city of Poland. Raised from the ashes of World War II, we begin our tour at St. John’s Cathedral, where Servant of God Stefan Cardinal Wyszynski is buried. Also see the Royal Castle Square, which features the magnificent royal residence and Sigmund Column. Next see the Jewish Quarter and Heroes Memorial. Dinner on your own and overnight in Warsaw. Depart Warsaw for Czestochowa, the center of Poland’s religious life and home of the famous icon of the Black Madonna. Celebrate Mass at the Shrine, followed by a guided tour. Then travel to Zakopane, St. John Paul II’s favorite place for recreation and relaxation. Dinner and overnight in Zakopane. Enjoy a tour of Zakopane, nestled in the scenic hills of Southern Poland. Celebrate Mass at Fatima Church, which was built by the mountaineers in gratitude for the Blessed Mother saving the life of St. John Paul II from the assassination attempt. (This church was blessed by St. John Paul II in 1999.) Take the Gondolas to Mt. Glubowka for a bird’s eye view over the city and hillsides of Zakopane where St. John Paul II used to climb the trails. Next, tour the city, followed by a delicious “highlander lunch”. This afternoon there will be time for strolling and shopping on Krupowki Street. Dinner on your own. Overnight in Zakopane. Depart Zakopane for Wadowice, the birthplace and hometown of St. John Paul II. Visit his house, which is now a museum. See the Basilica of the Offering of the Blessed Virgin Mary and see the baptismal font where St. John Paul II was baptized. After an independent lunch, travel to Kalwaria Zebrzydowska, known as the Polish Jerusalem. The Shrine is dedicated to the Passion of the Christ and also to the miraculous Icon of the Virgin Mary. Celebrate Mass at the Shrine. Continue on to Krakow, where you’ll enjoy dinner at the hotel. Overnight in Krakow. Visit the new St. John Paul II Center, where you will see the relics of St. John Paul II. Travel to the tomb of St. Faustina Kowalska where we will pray the Divine Mercy Novena. Tour the convent and the Basilica of the Divine Mercy, which was consecrated by St. John Paul II, during his last trip to Poland. Enjoy a talk given by one of the nuns and celebrate mass at St. Faustina Chapel of Divine Mercy. Transfer to Krakow to visit Market Square and to attend the opening of the Witt Stwosz Altar at the Mariacki Church (St. Mary’s Church). After lunch on own, continue on a guided tour of Krakow. Tour the Royal Chambers, Wawel Hill and the Cathedral, where St. John Paul II was ordained a priest and celebrated his first Mass. It is also the final resting place of St. Stanislaw and St. Hedwig, numerous Polish kings, poets and national heroes. Dinner on your own. Overnight at the in Krakow. Mass to be announced. Take a morning tour of the Kazimierz Jewish Quarter. Celebrate Mass at St. Stanislaw on the Rock Church. Lunch on your own. Depart for Auschwitz, the largest World War II concentration camp in Europe. Take a guided tour of the camp including the Shrine of St. Maximilian Kolbe. Return to Krakow. Dinner on your own and overnight in Krakow. Enjoy free time in Krakow this morning. Following lunch on your own, depart for Wieliczka. Upon arrival have a guided tour of the World Famous Salt Mines to see the statue of St. John Paul II, which is carved in salt (pending confirmation). Return to Krakow for your Farewell dinner in Poland at the famous fourteenth-century restaurant, “Wierzynek,” where kings and presidents have dined. Mass to be announced. Overnight in Krakow. This morning check out of the hotel and transfer to the airport for return flights to the USA.